I couldn’t think of a better way to spend my first weekend back in Sydney than at the One fine day wedding fair! 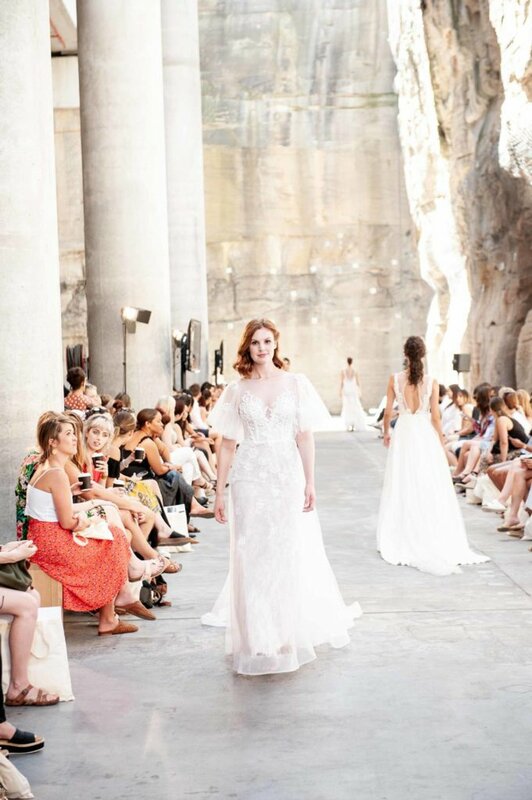 The two day event showcased the latest Australian bridal trends with the runway show set in the dramatic sandstone backdrop of the Bangroo cutaway. 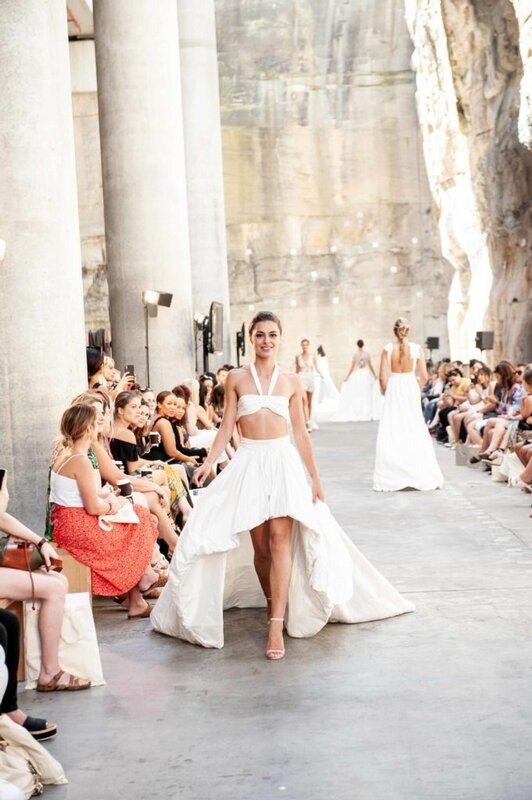 I was front and centre for the first runway show of the weekend and did not miss a single moment as over 80 incredible looks including Bridal, Menswear and Bridesmaids shimmied down the runway. Australian fashion is always a breathe of fresh air, never over complicated, easy on the eye and always willing to try something a little different. 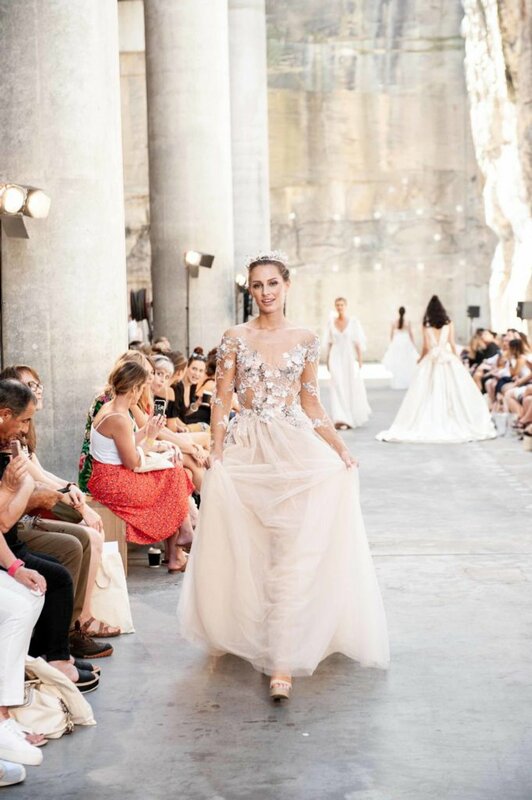 The runway was filled with plunging necklines, cut away backs and the dreamiest skirt and top combinations you ever did see! 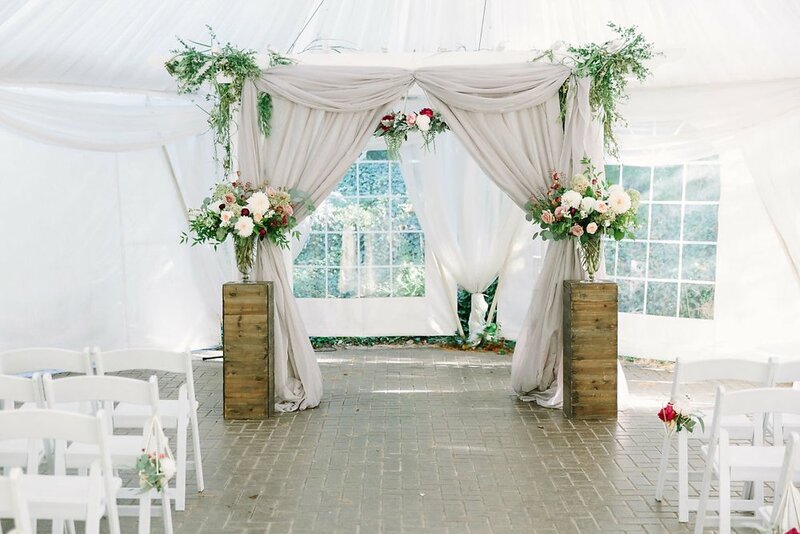 Wedding decor included elements of earthy tones with boho rugs and white backdrops for the minimalist bride or an abundance of hanging greenery and vines paired with crystal chandeliers, pomas grass and soft pastels for an elegant english garden vibe. 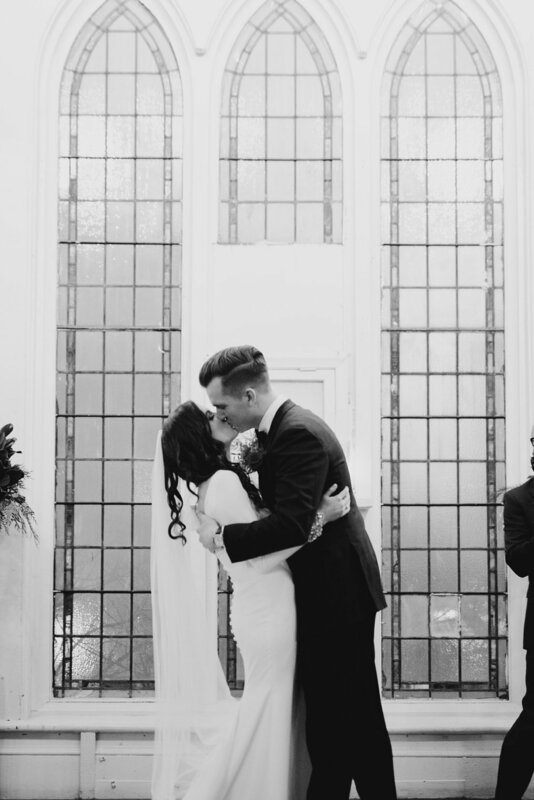 There is something incredibly magical about a winter wedding, I am not sure if it is the festive decorations, the white fluffy snow or cuddling up under the mistletoe toe for the first kiss as newlyweds. 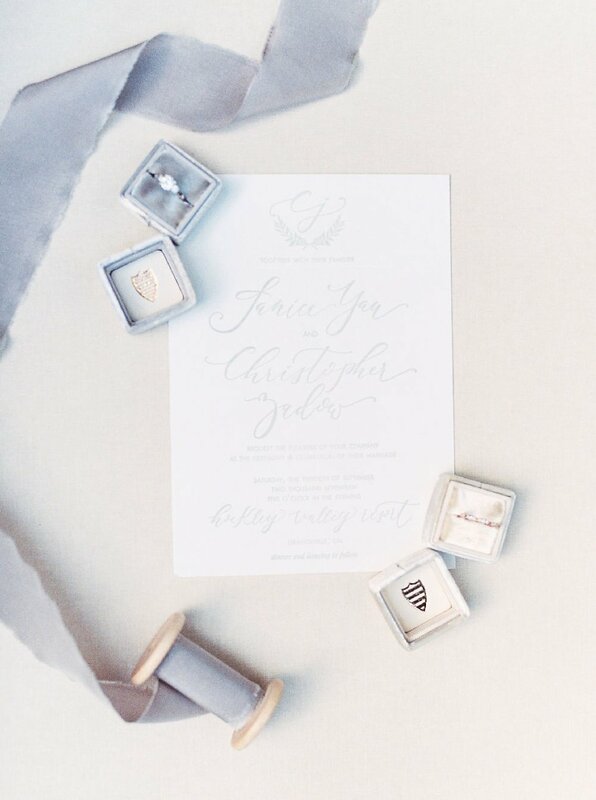 At BHC we are loving the trend of more and more brides choosing to say " I do" during the holiday season! 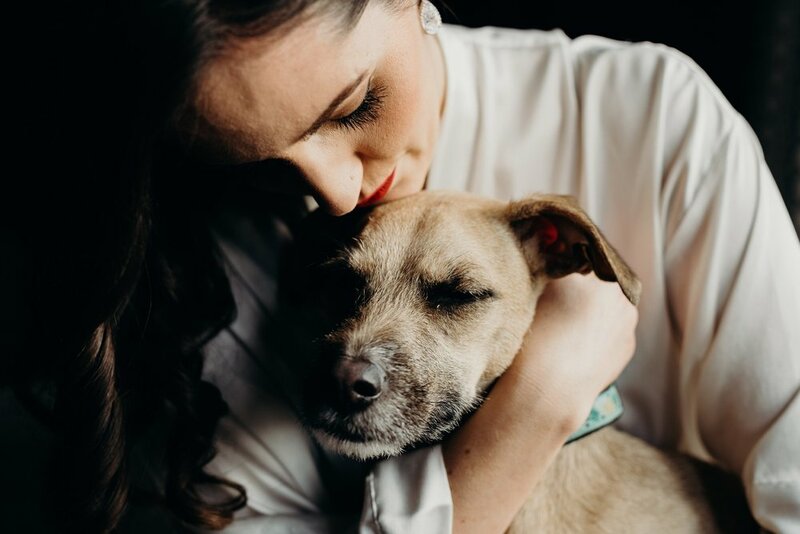 Monica’s wedding day morning was a hive of activity with her family home bustling with dogs, bridesmaids and festive cheer and I felt right at home, as the year before on exactly the same weekend I was styling the hair for her sister’s wedding in the same place! 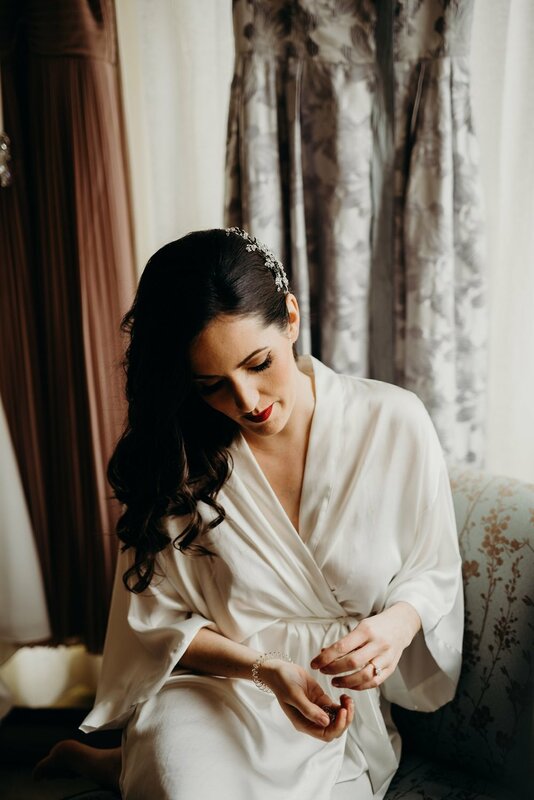 Monica's bridal style was modern with a touch of glam and after previewing a hairstyle choice of classic vintage waves she choose to go for a more natural hairstyle with elements of her everyday life! 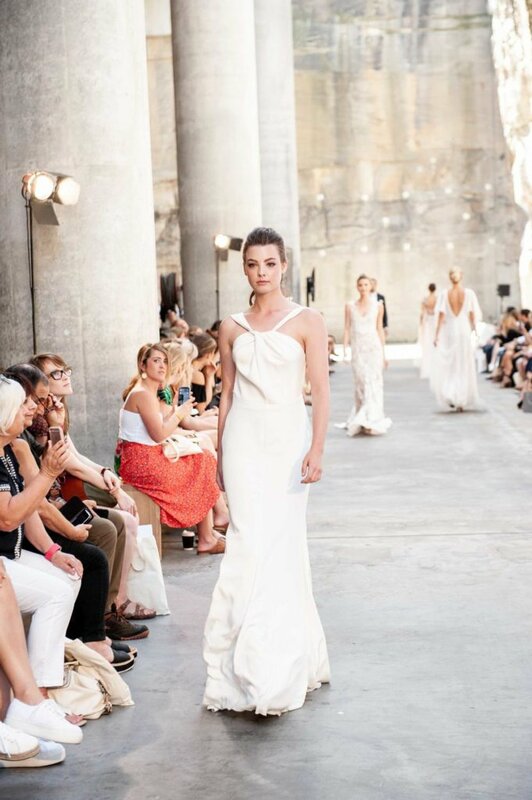 Sometimes less is more and there is no point trying to compete with such a show stopping gown! 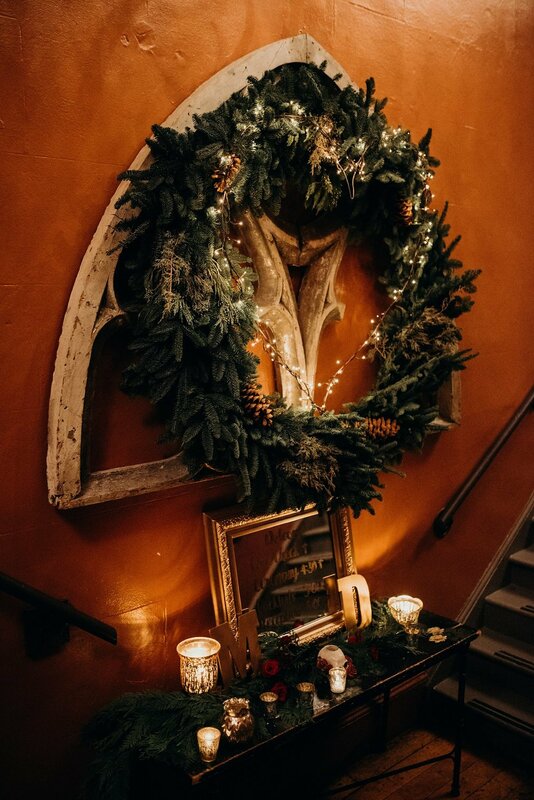 The Berkeley church in downtown Toronto is perfect for a wedding any time of year though fill it with Christmas wreaths, pinecones, gingerbread houses and a cool palette of green you would swear you have been transported to a Christmas wonderland fit for the movies! 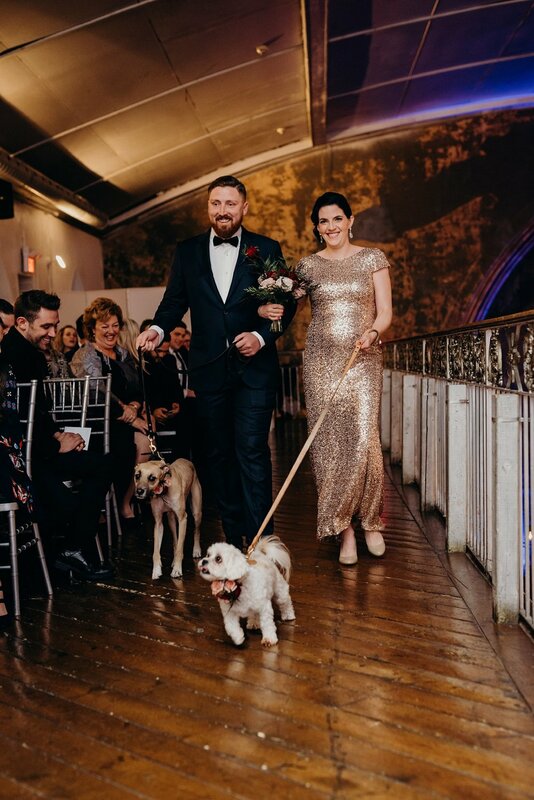 If you are into romantic first looks, candid captures, a whole lot of love and of course cute puppies, look no further then Monica and David’s winter nuptials! 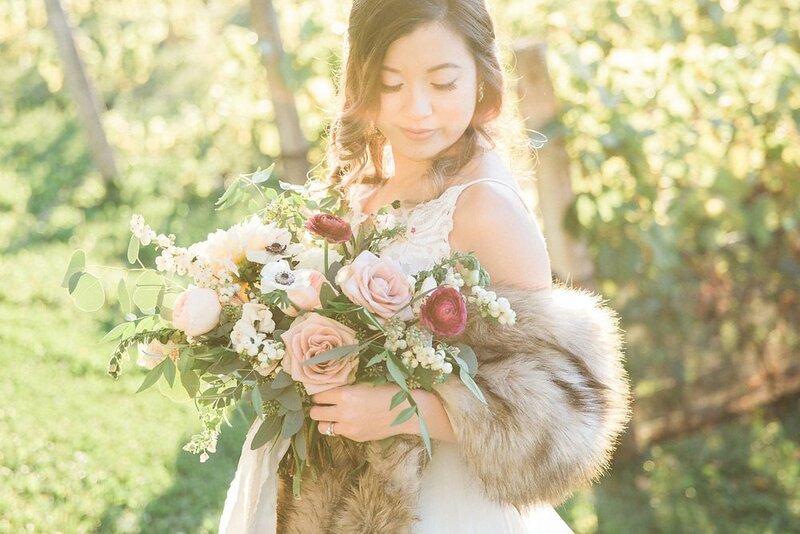 Our bubbly bride Janice had her hands full when she was planning her wedding at Hockley Valley Resort long distance from Ottawa, though this didn't stop her from adding some major DIY elements. Because lets face it if you have got the talent why hold back, especially on your wedding day! 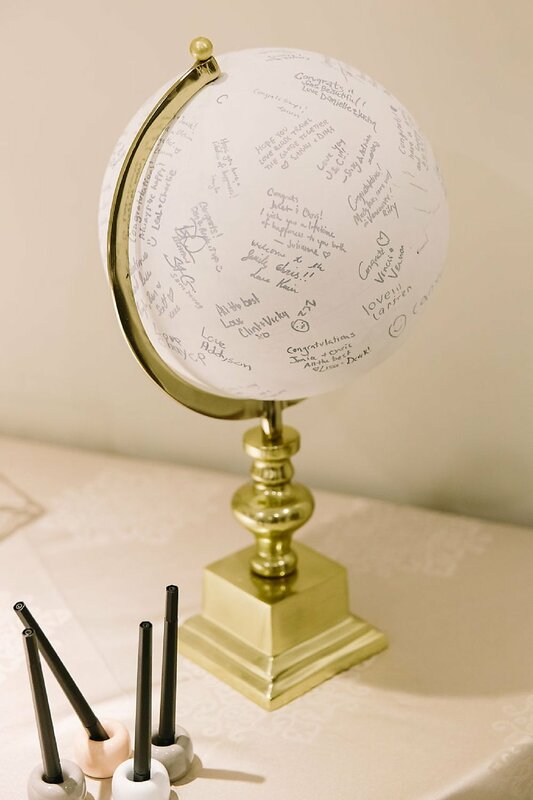 She designed all the of the stationary, calligraphy and signage as well as the decor and centre piece arrangements filling the room with personal and sentimental touches. Janice's original vision for her wedding day hairstyle was to wear it up, although after careful consideration she felt a down style would reflect more of her personal style. We opted for soft waves with a slight twist, adding an embellished hair vine at the back of the hairstyle which complemented her Hayley Paige gown perfectly. Hockley valleys’s lush backdrop and changing leaves set the tone for Janice and Chris’s nuptials and made for a magazine worthy photo session. 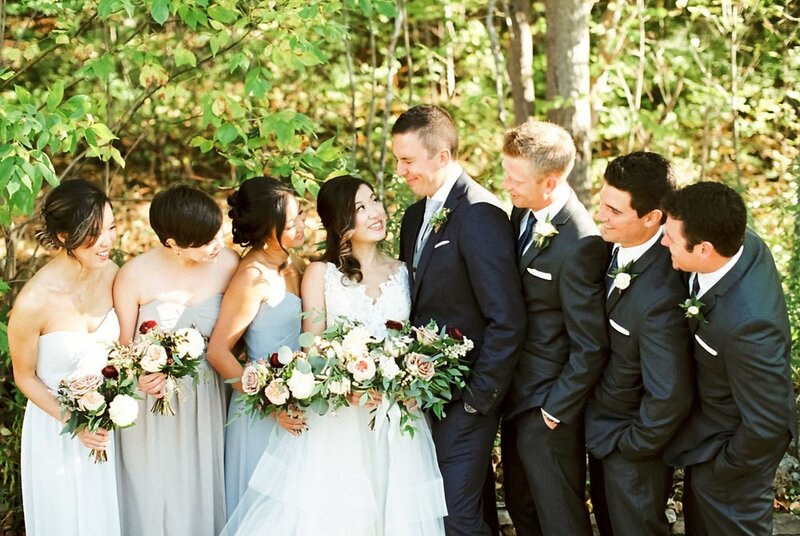 Lushana Bale photography will have you falling in love with every detail of this fall wedding. 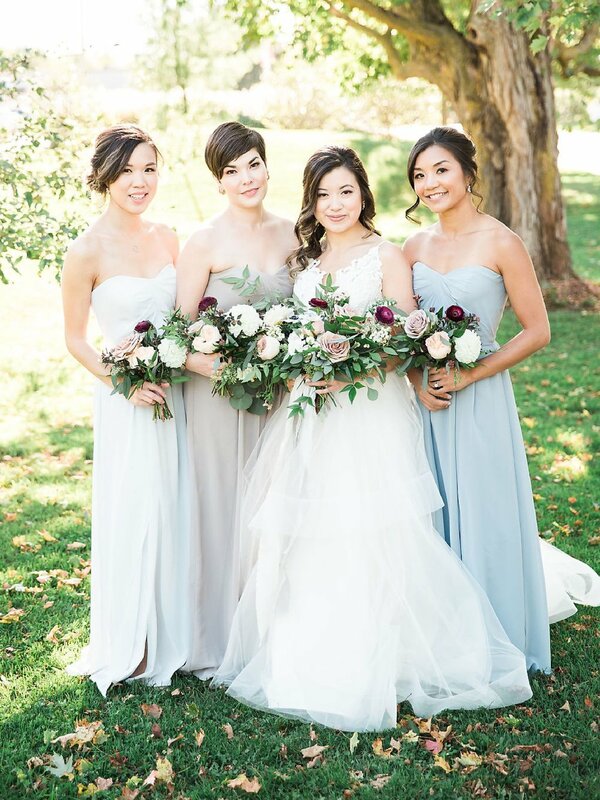 This beautiful wedding was recently featured on The Event Source blog! 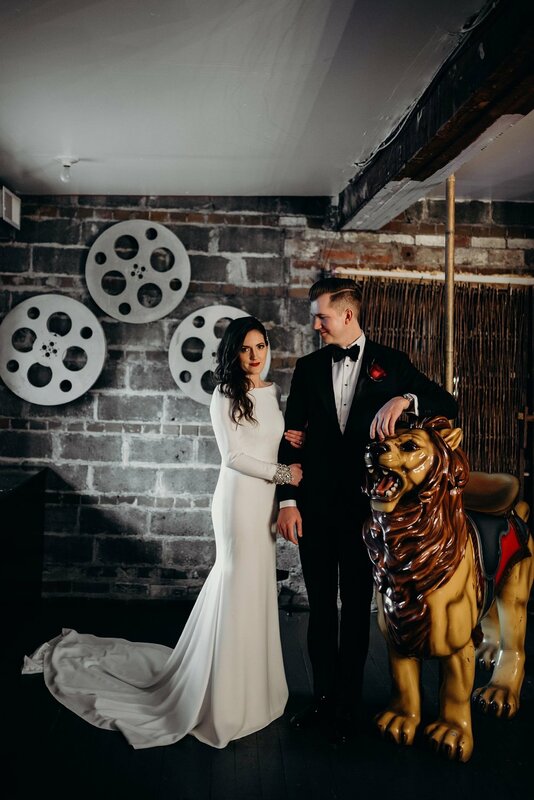 It was inevitable that Carolina's show stopping gown was going to spend a lot of time in the spot light on her wedding day created by local talent Catherine Langlois and inspired by an Oscar de la Renta design it was worthy of the red carpet! 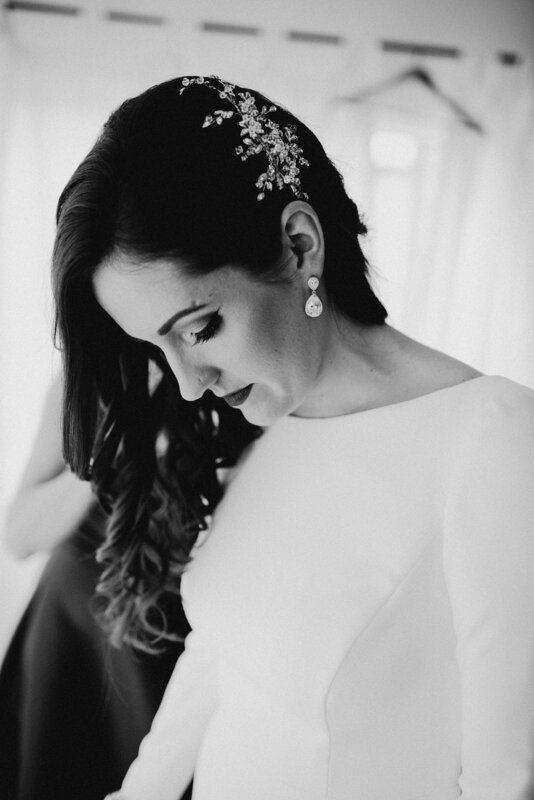 Not wanting to compete with her dress, we keep Carolina's bridal hairstyle elegant with a modern take on the French twist complementing the silhouette of her dress and all over bridal style. Carolina seamlessly paired her chic style and modern details with the elegant charm of The Burroughes building for their reception. 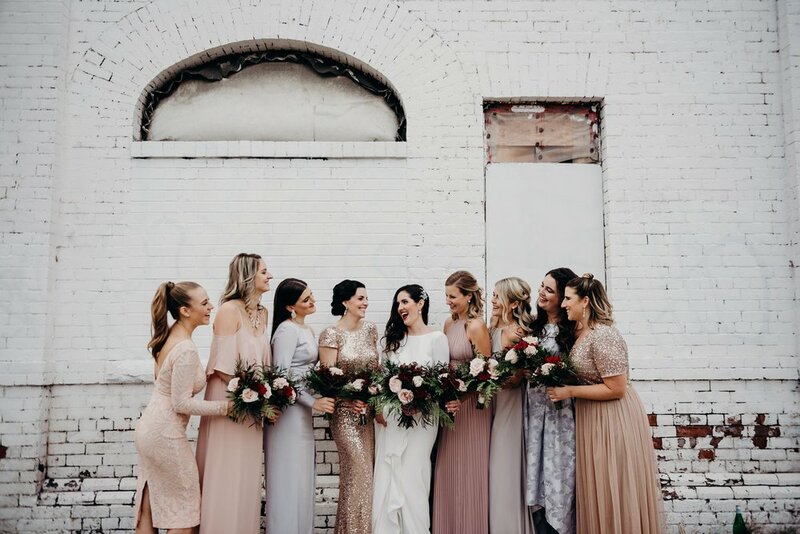 Carolina had a large bridal party and beauty team of four and rather then be confined to a small space she had the ingenious idea of renting out her condo party room, for the morning's preparations. This gave everyone plenty of space and an abundance of natural light, which your beauty team will always thank you for! It also allowed other family members to drop by and say hello in a relaxed and fun environment. 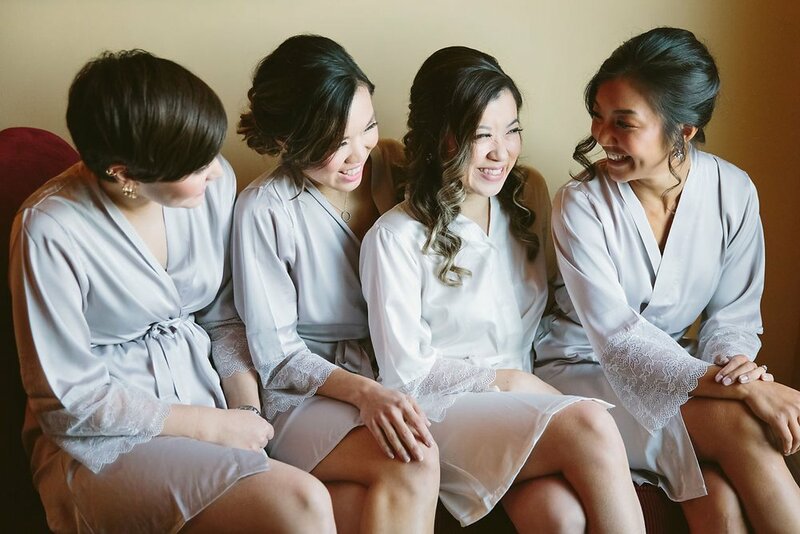 Even if you don't have your own condo with a party room ask around, I recently had a bride use a friends condo party room in Toronto, which also proved to be the perfect getting ready space for a larger bridal party! 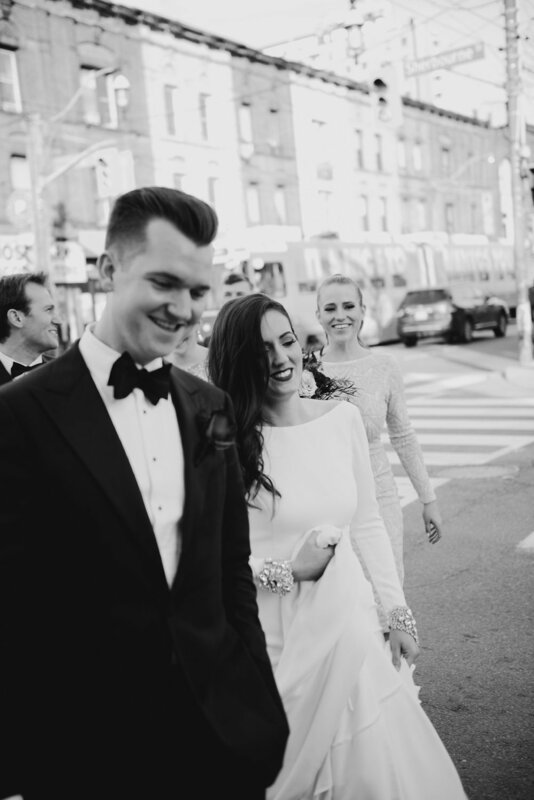 See it all unfold through the lens of Lindsey Grey with this beautiful wedding also recently featured on Event source. If you enjoyed this real wedding you may also enjoy.. " An intimate wedding at the Gardiner Museum". 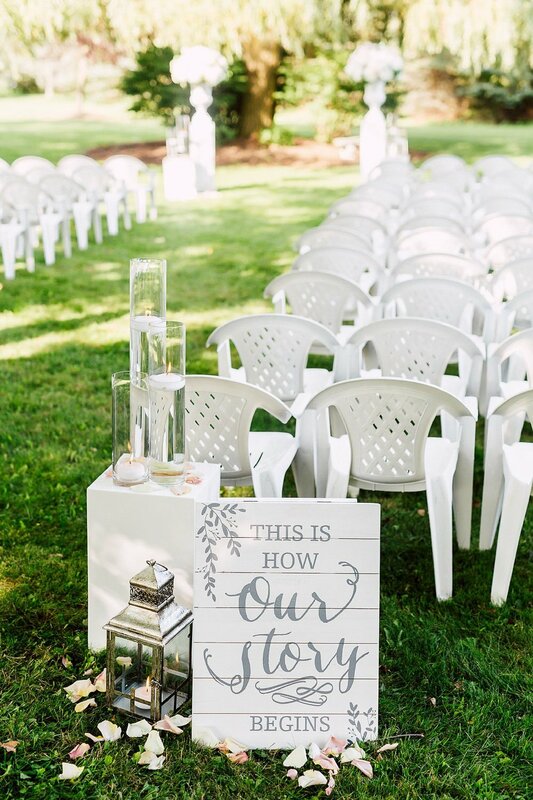 Having an outdoor wedding means that you will be dealing with humidity and hair that has the potential to frizz or become fly-away! Hydration is the secret to conquering frizz and fly-aways. Tame your mane in the lead-up to the wedding by topping up the moisture levels with weekly hydrating treatments, and leave-in moisture creams and oil based serums. Stop the moisture routine a week prior to the wedding to ensure your hair won't be weighed down with extra moisture. 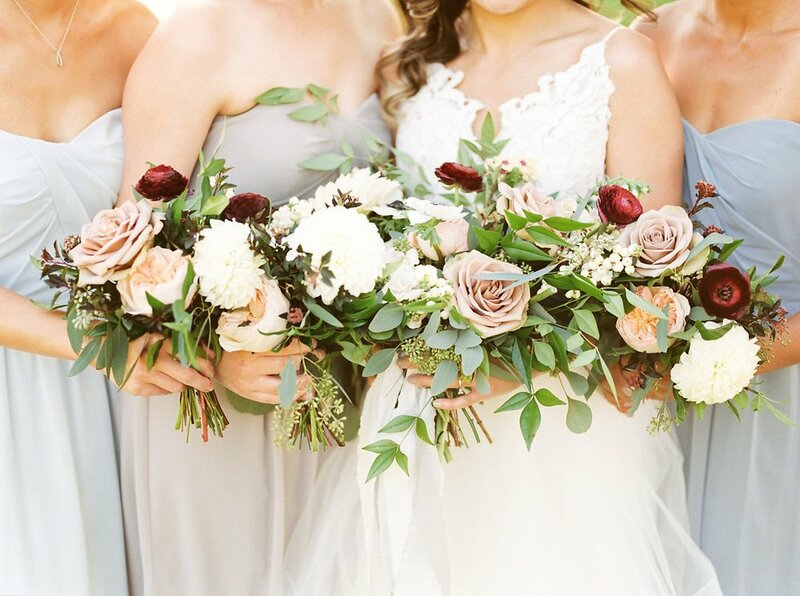 Waking up your wedding day morning with a serious case of bedhead is not the best start to picture perfect hair especially when you will also be dealing with the outside elements. Invest in a hair-friendly silk pillow case to help reduce static, frizz and to preserve your fresh blow-out which is the foundation for your wedding day hairstyle. All hair types come with limitations and the location of the wedding day should be a factor when choosing a wedding hairstyle. 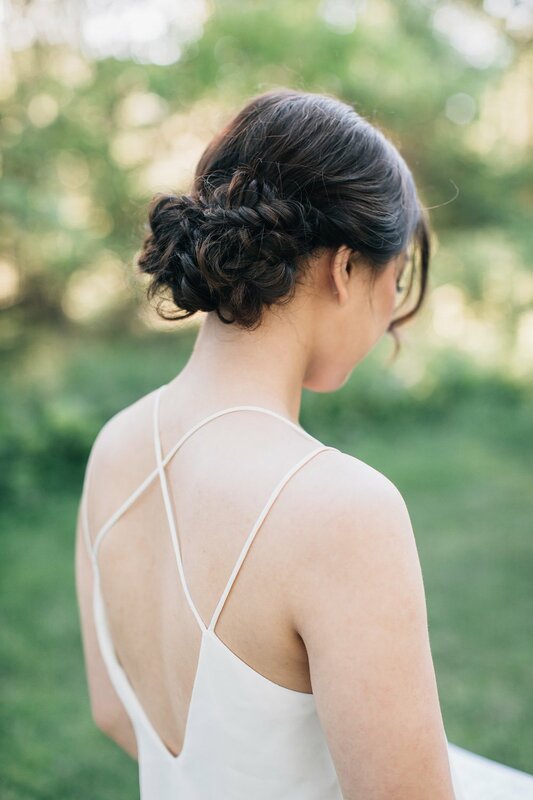 Updo's especially braids are fantastic for the warmer humid months and out door celebrations as they will stay in place all day leaving you with one less thing to worry about. If updo's aren't for you consider your natural texture and try to work with it. If your hair is naturally frizzy or fly- away consider a beach wave texture or hairstyles that are undone and imperfect like a textured pony or half updo. We are all about preventative measure and one of the best ways you can prepare the hair for an outdoor ceremony is with the right products. Your outdoor survival kit should contain a mini hairspray that does not contain water, there will be plenty of moisture in the air and hairspray that is water-free is and will help combat frizz. A few bobbie pins, Anti-humidity spray is a must for those hot humid days and last but not least a bounce dry sheet always comes in handy for static fly-away hair. 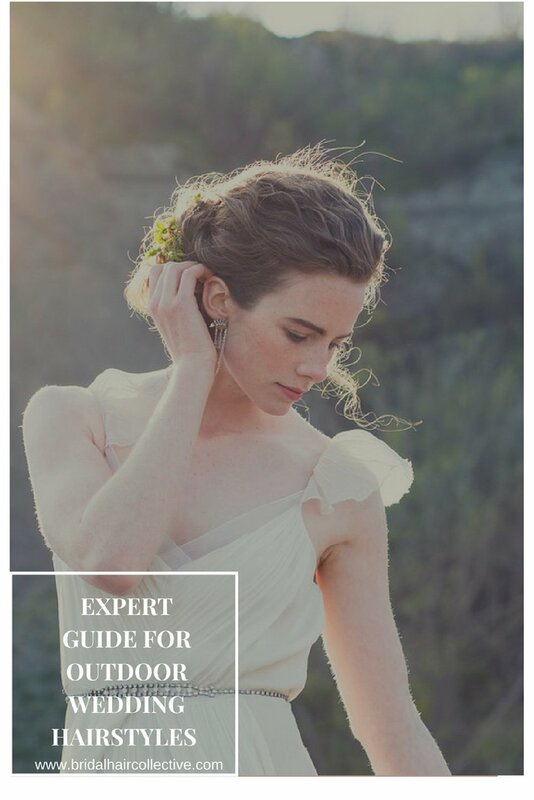 Our expert tips for outdoor hairstyles along with other Canadian hairstylists are also featured on bridesmade.ca this week! In December I attend a 5 day bridal work shop with the world renowned Elstile in sunny Pasadena, California. 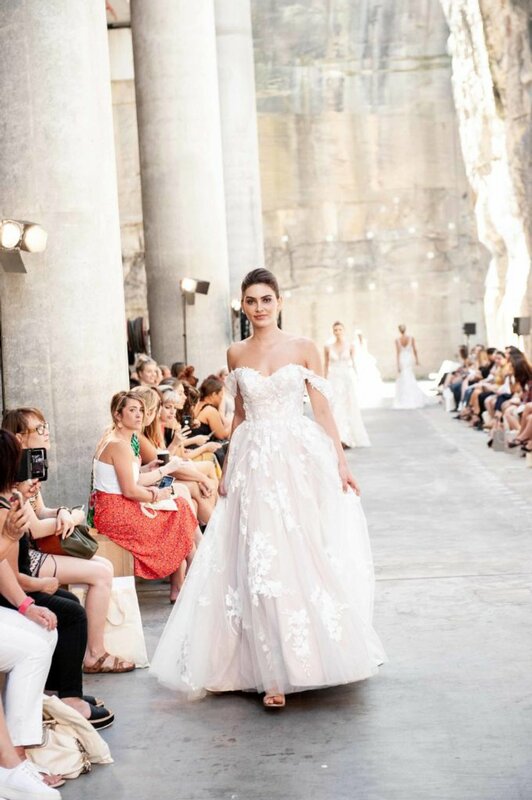 Elstile is a Russian hairstyling company that has been blowing up the bridal hair world with their romantic, effortless and intricate hairstyles for the last few years. If your a bride-to-be it is highly likely that you have a least one of their sought after hairstyles on your Pintreast board, and they are come of the most requested hairstyles from our BHC brides. I am a huge believer in education and much of my success has come from being able to offer our brides relevant, wearable hairstyles and when our brides started requesting these hairstyles I knew it was time to update my skill set and become Elstile certified. The class was the perfect size of seven students and our day was broken up into a look and learn in the morning and a practical lesson in the afternoon, our teacher Martin was everything you hope for in a teacher patience, talented, passionate and encouraging. Everything he touched turn to gold ,well hairstyle gold at least! The first day was the most challenging learning the Elstile signature curling technique of texture and volume waves whilst mastering the Elstile curling wand which is unlike any wand I have used, though after you get it its a game changer to longer lasting curls. Our teacher explained that: " In Russia the clients expect to spend many hours in the salon to create these hairstyles and if they are created quickly, it would be assumed that the hairstylist has created an average hairstyle or is inexperienced. In LA the clients expect these hairstyles to be created quickly within in an hour, if the stylist takes longer it is assumed they are a beginner or inexperienced". Striking a balance is key, as professionals it's our job to ensure our clients understand the complexly and time required to create these works of art. As you know roman was not built in a day and great hair was not styled in 20 mins! Choose a hairstylist that is Elstile certified or has completed their on-line course. Ensure your hair stylist is comfortable and confident in re-creating the Elstile hairstyles before booking their services. The majority of the Elstile hairstyles require hair extensions and padding, consult with your hair stylist prior to your hair trial to ensure you purchase the correct length/weight of hair extensions for your hairstyle choice. Depending on your hairstylists level of experience these looks can take a minim of 1.5 to 2.5 to create, they are full of intricate detailing and take time to create. So make sure you account for this in your wedding day schedule. If you are considering attending the practical workshop in Pasadena, I would recommend completing a least one on-line hairstyle technique before attending, so you can master how to use Elstile curling wand and you have a basic understanding of their signature setting style. I found the course to be an advanced level that would be ideal for a qualified hairdresser or students that have hair knowledge and styling skills. Elstile signture curls have varying degrees of longevity with there texture curls lasting 2-3 hours and ideal for a photoshoot, the volume curls are better suited for bridal hairstyling lasting 6-8 hours. Elstile hairstyles are complex and require time to re-create all the detail that is evident in their signature looks, if you are looking to create a quick hairstyle on a bride with limited time I would recommend suggesting an alternative hairstyles for your client. 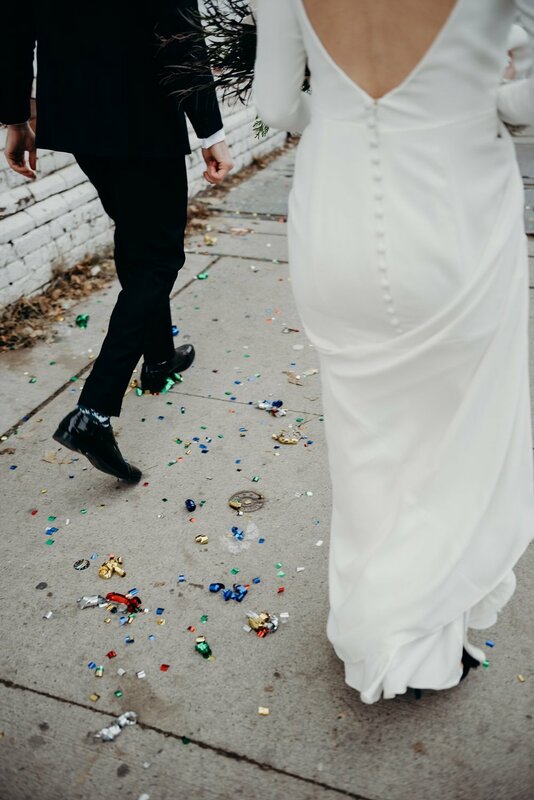 I get downright giddy whenever a friend asks me to be apart of their wedding day celebrations and it was no exception when the first assistant we employed at BHC asked me to do the honours for her special day! A hairstylist in her own right I knew I had to pull out all the stops! Lexi surrounded herself with the ultimate girl squad for her morning preparations they offered the right amount of support, laughs, stories and of course a mimosa or two. 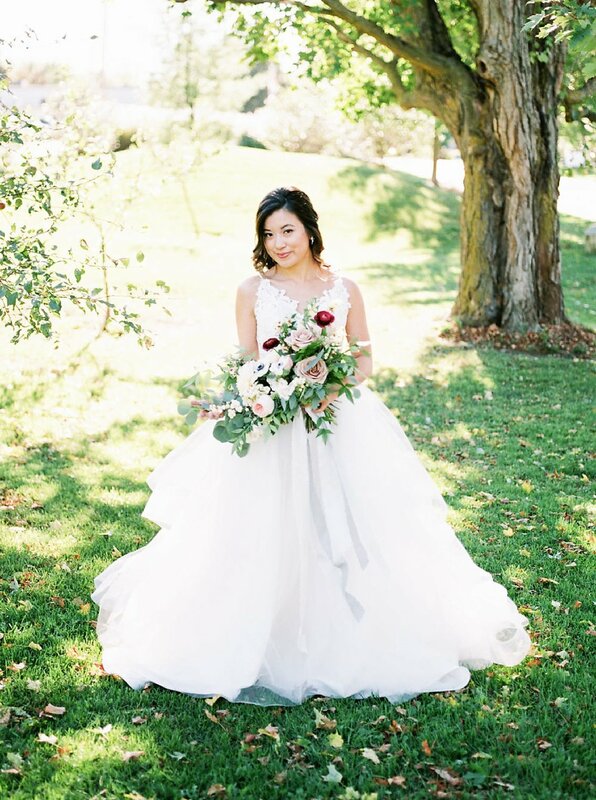 Her gorgeous wedding venue in White Oaks resort in Niagara-on-the-lake offered the convenience of a short walk down stairs to say her "I do" in an elegant outdoor celebration complete with an English garden vibe. 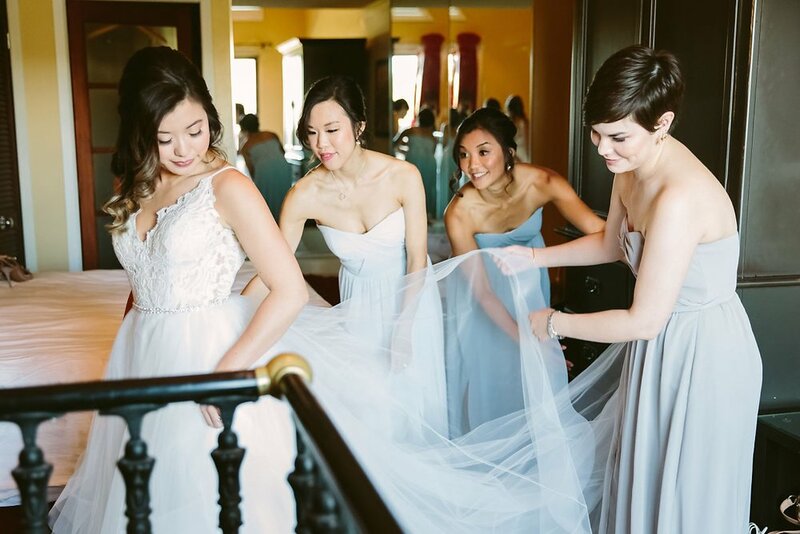 Photographer Jessica Douglas captured all the fabulous florals, intimate moments and never ending smiles, from the beautiful bridal party to the elegant reception you can soak it all up here. 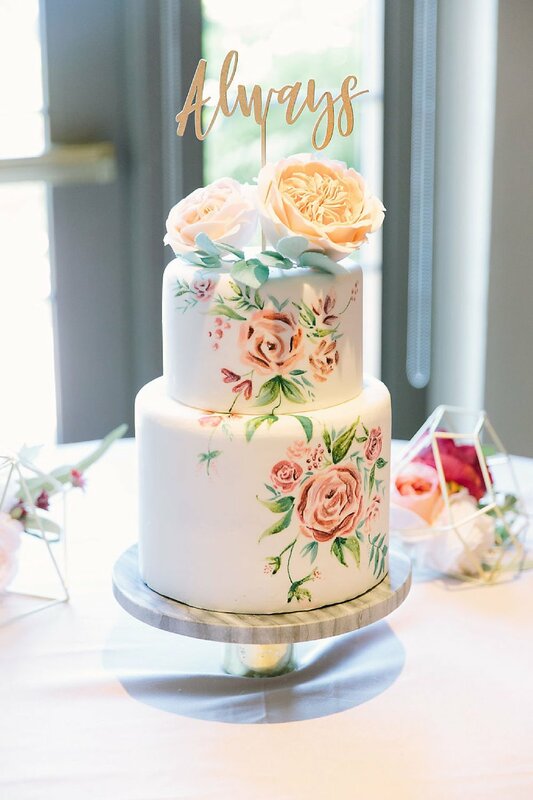 If you enjoyed this real wedding you may also enjoy.. "An elegant wedding at The Belcroft estate"
Hello melt your heart wedding...I have been dreaming about sharing this gorgeous affair on our blog since last summer, when I saw the sneak peak captured by Purple tree photography. It's a given that the Belcroft Estate is gorgeous all on its own, but when you throw in Veronica's and Daniels impeccable style it takes this venue to a whole new level. What makes it more extraordinary is how they pulled of this magazine worthy wedding in just three months of planning! 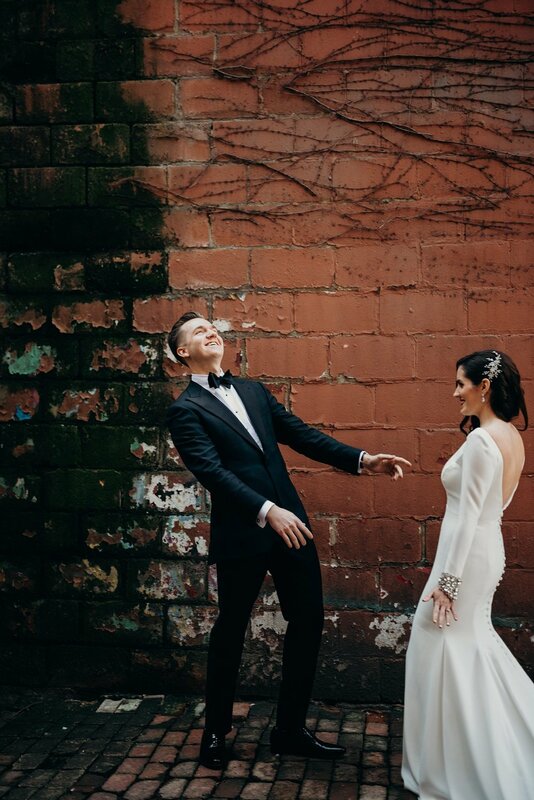 If you enjoyed this real wedding you may also enjoy A Spring wedding at The Gladstone Hotel.